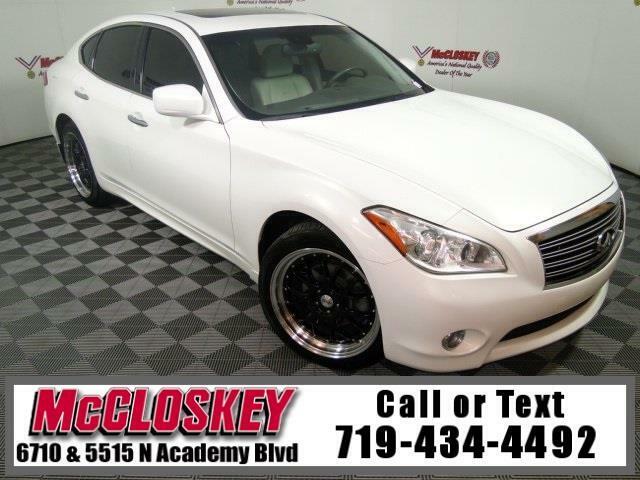 Pamper yourself 2012 Infiniti M37X All Wheel Drive with Navigation System, Power Moon Roof, Heated and Cooled Seats, Push Button Start, and Heated Steering Wheel! Standard on the M37 are 18-inch alloy wheels, automatic bi-xenon headlights, foglights, power-folding heated mirrors, automatic wipers, a sunroof, keyless ignition/entry, dual-zone automatic climate control, leather upholstery, heated eight-way power front seats, power lumbar support, driver memory functions, a power tilt-and-telescoping steering column and an auto-dimming rearview mirror. Also standard are a rearview camera, Bluetooth and a six-speaker stereo with a CD player, auxiliary audio/visual jack, an iPod interface and satellite radio.